Number of Bay Windows Typically Bay windows are quite large in size and have multiple changes in the angle of the frame and typically have multiple openings. Two Inertia Sensors are allowed for in our quotation for each Bay Window listed. Number of Velux Windows A Single Magnetic Contact is used to protect a Velux window in order to limit false activations from precipitation (i.e. heavy rain, hail) or animal interaction (i.e. Bird strike). The purpose of the contact is only to indicate the window is still open at the time of setting the alarm. HKC Wireless Key FOB (€47) A very useful device for the end user to control their alarm system. 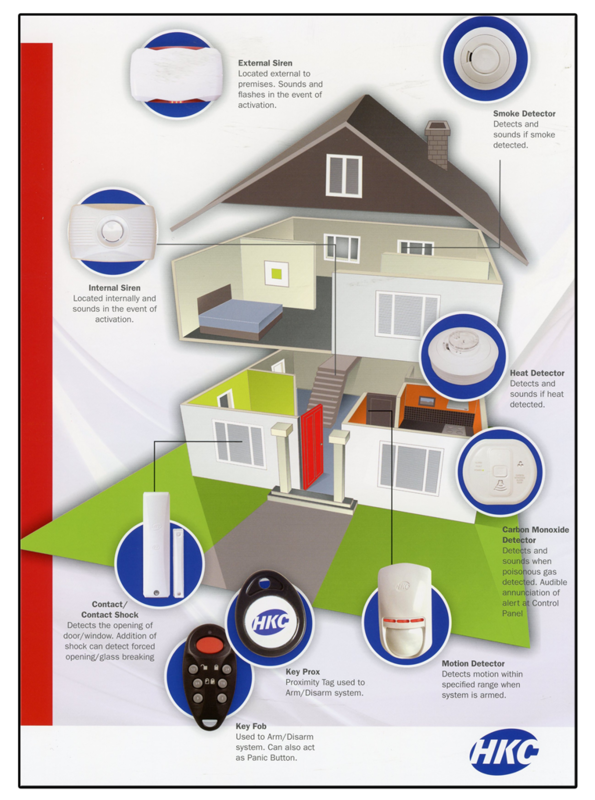 Remote arm and disarm your system along with a remote panic button. However you must be within range of the house. Dummy Bellbox (€28)TooltipIntalled as a visual deterrent to show the premises has an installed intruder alarm system by a reputable installer. All Lara Decoy Bellboxs are branded and look the same as the primary bellbox. Should be considered if home premises is very large.